Quarterfinals are tense affairs, regardless of the circumstances, but when the wind is stopping, starting and swirling, they can be very tense, and especially for players who hit the ball with little or no spin. All eight of today's competitors reported that the conditions were especially tough. Nevertheless, three of the four winners came through in straight sets, and they were undoubtedly relieved to do so. 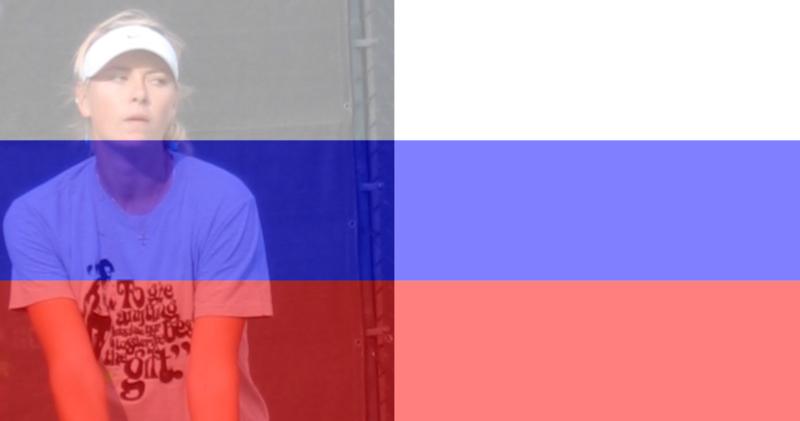 The first winner of the day was Russia's Daria Kasatkina, who upset 10th seed Irina-Camelia Begu 6-4, 6-1. The first set was quite competitive, then Begu faded away. Kasatkina, when she talked with the press, said that she had made a decision to become more aggressive in her play in order to progress on the tour. She's very solid. You know, it's dangerous if people are very solid and very aggressive at the same time, like they're aggressive but they don't miss. So that's a bad combination. For her it's a good combination. For the opponent it's tough. You know, you sometimes have these very aggressive players that also make a lot of errors, and then you have these solid players that don't hurt too much, but they just don't miss. She's kind of a little bit of both. She can step it up any time and that makes her really dangerous. In her quarterfinal, Siegemund took the first set off of 8th seed Anastasija Sevastova 6-2, but Sevastova began the second set in a dominating fashion, handling the wind well, and going up 3-0. Siegemund edged up to 2-4, then won four straight games to win the match. Both today and yesterday, the German player had relatively short matches ("Surprise!" she said, when this was pointed out today in her press conference), which she needed after the marathons she had against both Lesia Tsurenko and Venus Williams. 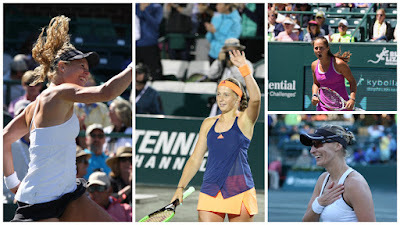 Later in the day, the crowd was thrilled when their hometown player, Shelby Rogers, took the first set off of 11th seed Mirjana Lucic-Baroni in a tense tiebreak set. Lucic-Baroni hits the ball really flat, which is a real obstacle in the wind. But she turned the match around and won it 6-7, 6-1, 6-1. The Croation star, who made a dramatic run to the 2016 Australian Open semifinals, said that because she hits the ball so flat, she had exceptional trouble with the wind. Lucic-Baroni also said that she "never was on the ball and was hitting the ball clean." But with all the difficulty Lucic-Baroni experienced, she was able to win nine straight games and totally dominate Rogers in the last two sets. The night match featured 5th seed Caroline Wozniacki (the 2011 Charleston champion) and Jelena Ostapenko. But from start to finish, it was really the Ostapenko Show. The 19-year-old from Latvia hit 40 winners and made 26 unforced errors, which is a beautiful statistic. She beat Wozniacki 6-2, 6-4, and while it took her several deuces and a few match points to reach her goal, she was solid throughout the match. So dominant was Ostapenko that her opponent commented, after the match: "Everything was going in. She was hitting the lines. Everything that could go her way today was going her way." From Ostapenko: "...I just tried and I think it was not bad." Ostapenko, who has never played in Charleston before, is a busy woman: She is also still part of the doubles draw. The Volvo Car Open will have a first-time champion on Sunday, and it's anyone's guess as to who that champion will be. Each woman has played aggressively and has made her mark on the tournament, and each is playing extremely well. I'm expecting two high-quality semifinals on Saturday--perhaps even more exciting than we've seen in a while at this event. I can't stress enough how very competitive these four players have been.